Thank you for taking the time to visit my website. 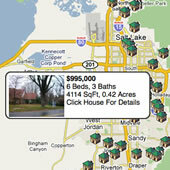 I specialize in assisting BOTH Buyers and Sellers all along the Utah Wasatch Front. I also specialize in Short Sales, a growing need during these times. My website contains ALL listings from ALL Real Estate Agents in the State of Utah, as well as the tools to obtain your Home's Current Value. Please feel free to explore the website and if you have any questions, would like to see a home in person or discuss your Home's CURRENT Value, Please give me a call today at (801) 309-3268.